Allahabad Bank SO 2019 Syllabus Check Here. Allahabad Bank Notification is out. Allahabad Bank is recruiting for 92 SO Govt Job Posts. You can check Allahabad Bank - Allahabad Bank last date, download Allahabad Bank notification, visit Allahabad Bank official website and check other Allahabad Bank Vacancy details.Complete Vacancy and recruitment Details about 92 SO Govt Job vacancies in Allahabad Bank are provided below by JobSarkari.Com only for you. Last Date For Apply Online. 29/04/2019. Last Date of Pay Fee. 29/04/2019. Mode of Payment. Candidate Can Application Fee Through Debit And Credit Card or Through Net Banking. Security Officer. 04. 02. 01. 02. 01. 10. Civil Engineer. 03. 01. 00. 00. 00. 04. Manager (Fire Safety). 01. 00. 00. 00. 00. 01. Manager (Law). 03. 04. 01. 02. 05. 15. Company Secretary. 01. 00. 00. 00. 00. 01. Manager IT- Net Work Manager. 02. 00. 00. 00. 00. 02. Manager IT- Security Administrator. 02. 00. 00. 00. 00. 02. Manager IT- System Administrator. 02. 00. 00. 00. 00. 02. Manager IT- Big Data Analytics. 02. 00. 00. 00. 00. 02. Financial Analyst. 08. 17. 06. 12. 08. 51. Manager. 02. 00. 00. 00. 00. 02. Total Vacancy. 30. 24. 08. 16. 14. 92. Security Officer. Candidate Must Have Passed Graduation With 5 Years Experience in Related Field. Min 20 And Max 35 Years. Civil Engineer. Candidate Must Have Passed 4 Years BE/ B.Tech Degree in Civil Engineering. Min 20 And Max 35 Years. Manager (Fire Safety). Candidate Must Have Passed BE in Fire/ B.Tech in Safety And Fire Engineering/ B.Tech in Fire Technology And Safety Engineering With 3 Years Experience in Related Field. Min 21 And Max 35 Years. Manager (Law). Candidate Must Have Passed LLB With 3 Years Experience in Related Field As Mentioned in Notification. Min 20 and Max 35 Years. Company Secretary. Candidate Must Have Passed Degree With ACS And Having 2 years Experience in Related Field. Min 21 And Max 35 Years. Manager IT- Net Work Manager. Candidate Must Have Passed Engineering Degree in Computer Science/ Computer Application/ IT/ Electronics As Mentioned in Notification. Having Post Graduation Degree in Electronics/ Electronics And telecommunication/ Electronics And Communication As Mentioned in Notification. Having Graduation with DOEACC B Level Certificate And Having 2 Years Experience in Related Field. Min 20 And Max 35 Years. Manager IT- Security Administrator. Candidate Must Have Passed Engineering Degree in Computer Science/ Computer Application/ IT/ Electronics As Mentioned in Notification. Manager IT- System Administrator. Candidate Must Have Passed Engineering Degree in Computer Science/ Computer Application/ IT/ Electronics As Mentioned in Notification. Manager IT- Big Data Analytics. Candidate Must Have Passed Engineering Degree in Computer Science/ Computer Application/ IT/ Electronics As Mentioned in Notification. Financial Analyst. Candidate Must Have Passed Graduation And CFA/ ICWA/ MBA in Finance/ PGDBM With 2 Years Experience in Related Field. Min 20 And Max 35 Years. Manager. Candidate Having MBA/ CA/ ICWA With 3 Years Experience in Related Field. Min 24 And Max 35 Years. 10. Online Applications Can be Submitted on or Before 29th April 2019. Q. 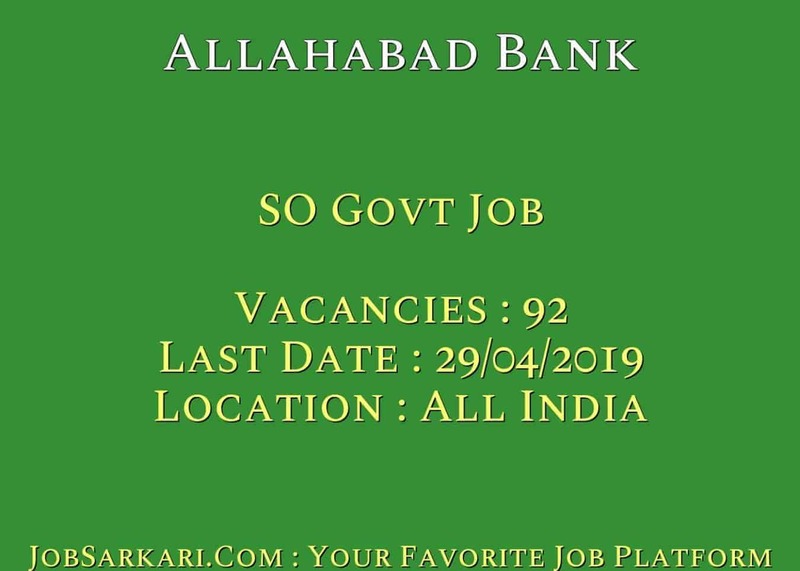 What is the Last Date For Allahabad Bank SO Govt Job Vacancy ? A. 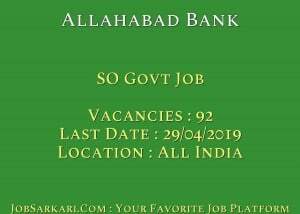 Last Date for Allahabad Bank SO Govt Job Posts is 29/04/2019. Q. What is the Form Type of Allahabad Bank SO Govt Job Recruitment ? A. The Form Type for Allahabad Bank SO Govt Job Posts is Online. Q. How many vacancies are available in Allahabad Bank SO Govt Job Posts ? A. There are about 90 Vacancies in Allahabad Bank SO Govt Job Posts. Q. What is the Full Form of Allahabad Bank ? A. Full Form of Allahabad Bank is Allahabad Bank .